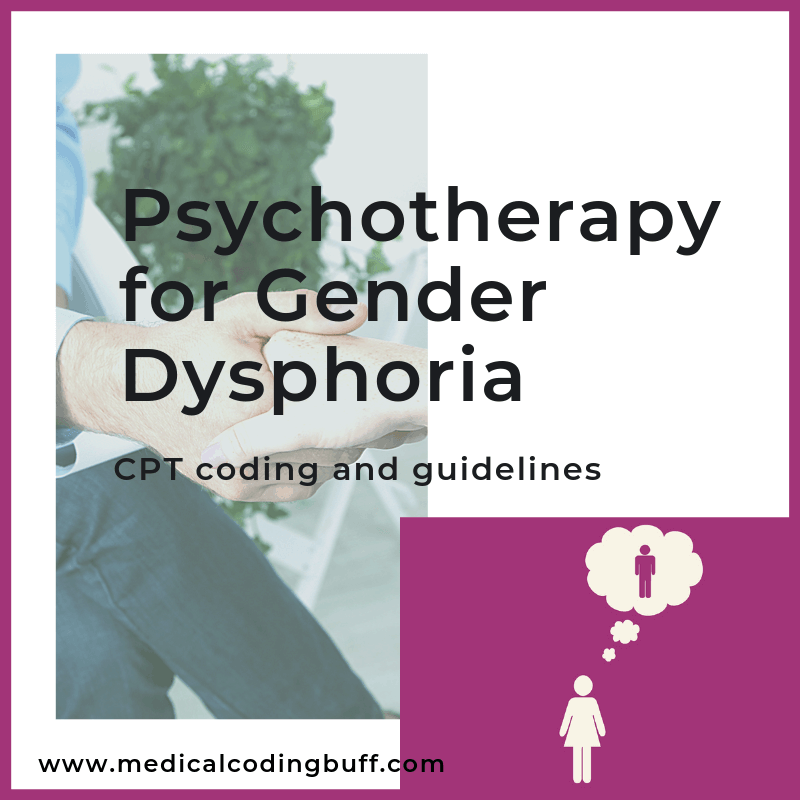 In this coding scenario, you will learn one patient’s experience with gender dysphoria and how to assign the correct CPT code for psychotherapy for gender dysphoria based on who was involved in the counseling and how much face-to-face time was spent. Question: Patient with gender dysphoria is seen for psychotherapy today due to feelings of anxiety and high levels of stress. Patient was assigned female at birth but never felt comfortable with that identity, nor that of a male. Patient tells the psychotherapist that she prefers that people refer to her as “they” rather than she or he. Some friends and family members are acceptable of patient’s situation, but some are not. This gives patient great stress having to go out in public and deal with people’s reactions. During the therapy session, patient expresses anxiety over menstruation and their changing body. Discussion took place on how to reduce the dysphoria and how to talk to people about gender to relieve some of the anxiety. The session lasted 45 minutes. Assign the CPT code. Looking in the CPT coding manual Index, see Psychotherapy, Individual Patient/Family Member 90832-90834,90836, 90838. The therapy session for this visit lasted 45 minutes, so the correct code is 90834. Psychotherapy is the treatment of mental illness and behavioral disturbances by a physician or other qualified healthcare professional. According to the AMA guidelines, psychotherapy services are located in the Medicine/Psychiatry section. Psychiatry includes diagnostic services, psychotherapy, and other services to an individual, family or group. Psychotherapy is the use of therapeutic communication to alleviate emotional disturbances, reverse or change maladaptive patterns of behavior, and to encourage personality growth and development. Treatment may include just the patient or it may include patient and an informant, such as a family member or friend. The sessions must be face-to-face, and the patient must be in attendance for all or most of the service. Psychotherapy codes are reported with CPT codes 90832, 90833, 90834, 90836, 90837, and 90838. Per the coding guidelines, if psychotherapy alone is provided with the patient, the following codes should be reported based on time: 90832 – 30 minutes (16-37 minutes), 90834 – 45 minutes (38-52 minutes), or 90837 – 60 minutes (53+ minutes). If a session lasts less than 16 minutes, it should not be reported. Guidelines also state if medical evaluation and management services are performed with the psychotherapy, we would need to report CPT code 90833 for 30 minutes, 90836 for 45 minutes, and 90838 for 60 minutes. Note these codes are add-on codes and should be reported in addition to the code for the primary procedure. Be sure to read all the parenthetical notes associated with each code.